Date: 1-Dec-13. Time: 5:12. Vessel type: Oil Tanker. Flag: Liberia. GRT: 58100. 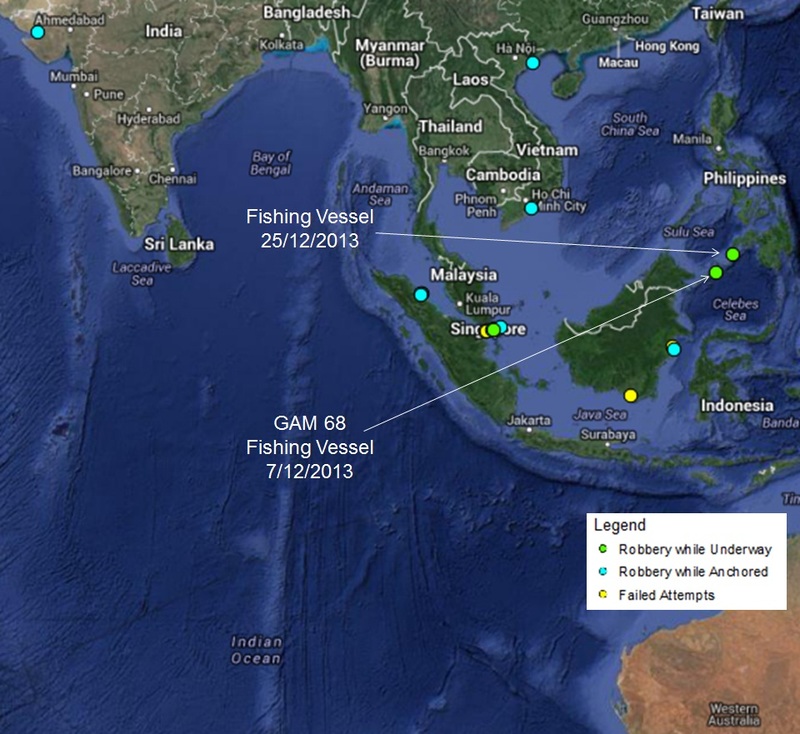 Position: 1° 06.00′ N – 103° 38.00′ E . Location: Nipah Anchorage, Indonesia. Area: South China Sea. 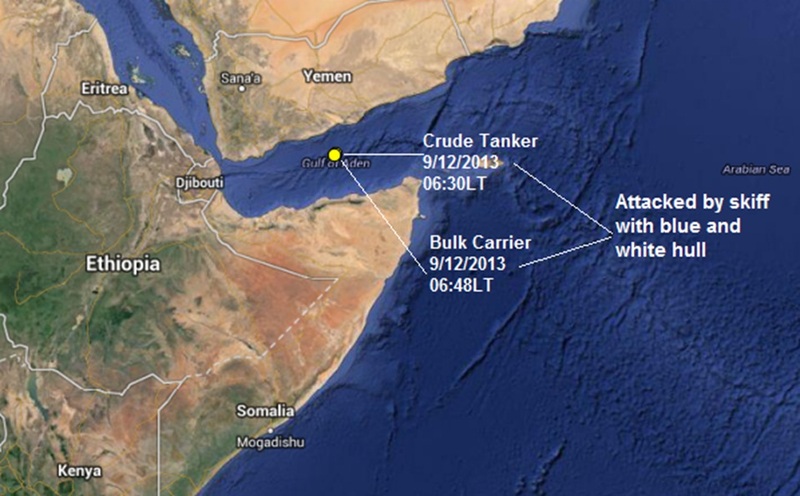 One robber armed with a knife boarded an anchored tanker during STS operations. The duty O/S on routine rounds noticed the robber and informed the OOW. Alarm raised and all crew mustered. Seeing the crew alertness, the robber escaped empty handed in a wooden boat. Date: 2-Dec-13. Time: 1:30. 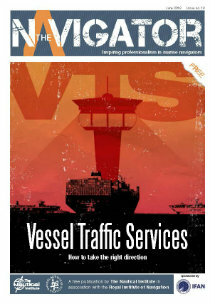 Vessel type: Containership. Flag: Singapore. GRT: 13448. Position: 20° 35.00′ N – 107° 05.00′ E. Location: Off Norway Island, Haiphong, Viet Nam. Area: South China Sea. Pirates boarded, stole ship’s property and escaped unnoticed from the drifting ship. The theft was noticed by the duty crew during making routine rounds. Date: 4-Dec-13. Time: 19:55. Vessel type: Bulk carrier. Flag: Switzerland. GRT: 20924. Position: 22° 47.00′ N – 70° 05.00′ E . Location: Kandla Anchorage, India. Area: Arabian Sea. Three robbers boarded an anchored bulk carrier. OOW spotted the robbers and raised the alarm. Seeing alerted crew the robbers escaped with stolen ship’s property. Date: 5-Dec-13. Time: 21:00. Vessel type: Bulk carrier. Flag: Liberia. GRT: 28073. Position: 3° 43.00′ S – 114° 25.00′ E. Location: Taboneo Anchorage – Indonesia. Area: South China Sea. A robber tried to board an anchored ship via the hawse pipe. Duty crew on routine rounds saw the robber and immediately informed the OOW who raised the alarm resulting in the robber escaping without stealing anything. Date: 7-Dec-13. Time: 5:30. Vessel type: Oil Tanker. Flag: Singapore. GRT: 56365. Position: 1° 07.00′ N – 103° 35.00′ E. Location: Nipah Anchorage, Indonesia. Area: South China Sea. Four robbers armed with knives boarded an anchored tanker during STS operations. Duty Engineer spotted the robbers near the ECR and quickly raised the alarm. Seeing the crew alertness, the robbers escaped empty handed. Date: 9-Dec-13. Time: 3:30. Vessel type: Oil Tanker. Flag: Bahamas. GRT: 42443. Position: 12° 50.00′ N – 47° 49.00′ E. Location: Gulf of Aden, Djibouti. Area: East Africa. Five robbers armed with guns in a skiff approached and fired upon the tanker underway. Master raised alarm, activated fire hoses, increased speed, took evasive manoeuvres and contacted UKMTO for assistance. The on-board armed security team took their position and showed their weapons resulting in the robbers aborting the attempted attack. A military helicopter came to the location to assist and patrolled the area. Date: 9-Dec-13. Time: 3:48. Vessel type: NA. Flag: Hong Kong. GRT: 75750. Position: 12° 52.50′ N – 47° 52.40′ E. Location: Gulf of Aden, Djibouti. Area: East Africa. Five robbers armed with guns in a skiff approached the ship underway. Master raised alarm, activated fire hoses, sounded ship’s horn, took evasive manoeuvres and non-essential crew members mustered in the citadel. The on-board armed security team took their position and showed their weapons but the skiff continued to approach the ship even after the armed team fired a warning flare towards the skiff. The security team fired warning shots as the skiff came closed to the ship. The robbers responded by engaging the ship with small arms fire and the security team returned fire resulting in the robbers aborting the attempted attack. A military helicopter came to the location to assist. Date: 10-Dec-13. Time: 1:20. Vessel type: Oil Tanker. Flag: Panama. GRT: 28517. Position: 1° 25.20′ N – 104° 41.50′ E . Location: Pulau Bintan, Indonesia. Area: South China Sea. Five robbers boarded an anchored tanker while crew were busy performing tank cleaning procedures. 2/E on duty in the engine room noticed the robbers and informed bridge who raised the alarm. The robbers escaped immediately upon hearing the alarm with stolen engine spares. Date: 12-Dec-13. Time: 6:00. Vessel type: Oil Tanker. Flag: Comoros. GRT: 40516. Position: 1° 06.00′ N – 103° 37.00′ E. Location: Nipah Anchorage, Indonesia. Area: South China Sea. 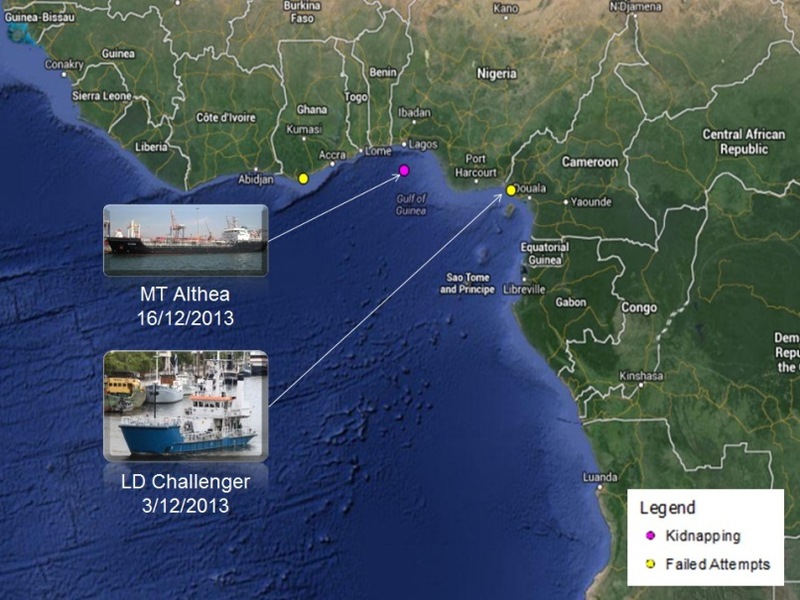 Three to four robbers boarded an anchored tanker via the stern. They were immediately spotted by the duty officer who raised the alarm. Seeing crew alertness, the robbers escaped in their boat. A through search of the vessel showed that no stores and valuables were stolen. All access to accommodation, engine room and stores were locked and secured. Date: 15-Dec-13. Time: 3:30. Vessel type: Product tanker. Flag: Hong Kong. GRT: 29266. Position: 6° 20.40′ N – 3° 22.10′ E. Location: Lagos anchorage, Nigeria. Area: West Africa. While at anchor, a suspicious boat approached towards the vessel bow. The crew alerted the armed security personnel on deck. One of the armed security personnel fired warning rounds into the sea. Date: 16-Dec-13. Time: 0:00. Vessel type: Chemical tanker. Flag: Marshall Islands. GRT: NA. Position: NA. Location: Off Nigeria. Area: West Africa. 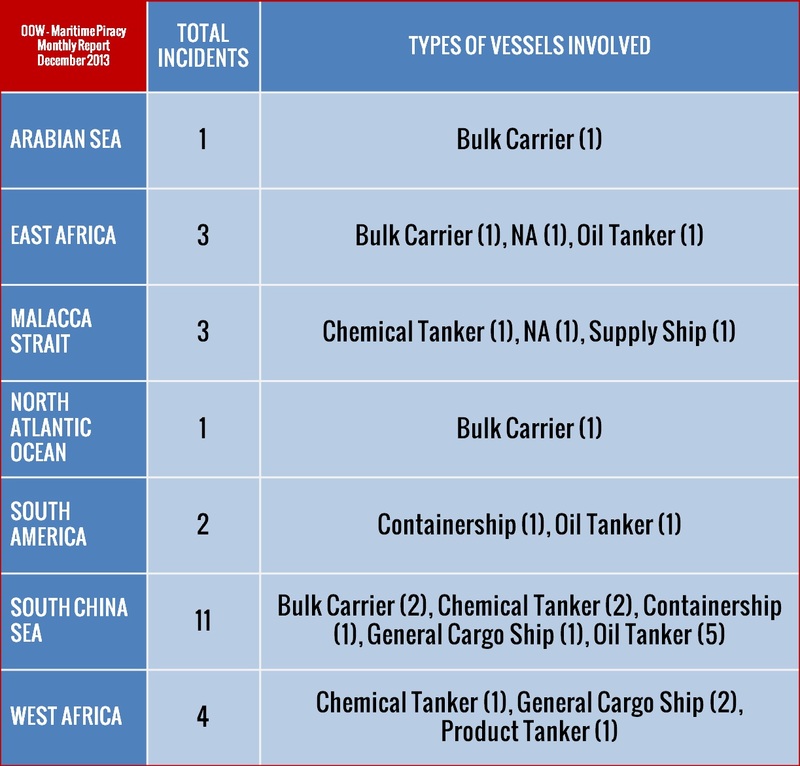 Ten pirates attacked an oil products tanker and its 18 crewmembers approximately 35 nm off the Niger Delta. 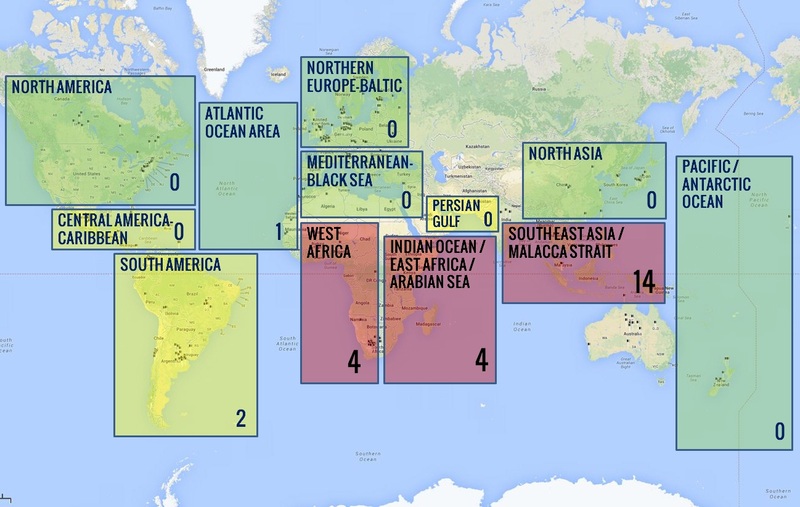 After boarding the vessel, the pirates kidnapped the Ukrainian captain and a Greek engineer. Date: 16-Dec-13. Time: 20:00. Vessel type: Oil Tanker. Flag: NA. GRT: 59611. Position: 0° 06.00′ S – 117° 34.00′ E. Location: Santan Anchorage, Indonesia. Area: South China Sea. A robber boarded an anchored crude oil tanker. Alert duty watchman notified the bridge and alarm raised resulting in the robber escaping. Crew mustered and searched the ship. All crew safe and no ship’s stores reported stolen. Date: 18-Dec-13. Time: 1:40. Vessel type: Bulk carrier. Flag: Bahamas. GRT: 32545. Position: 0° 15.60′ S – 117° 35.30′ E. Location: Muara Berau Anchorage, Samarinda, Indonesia. Area: South China Sea. 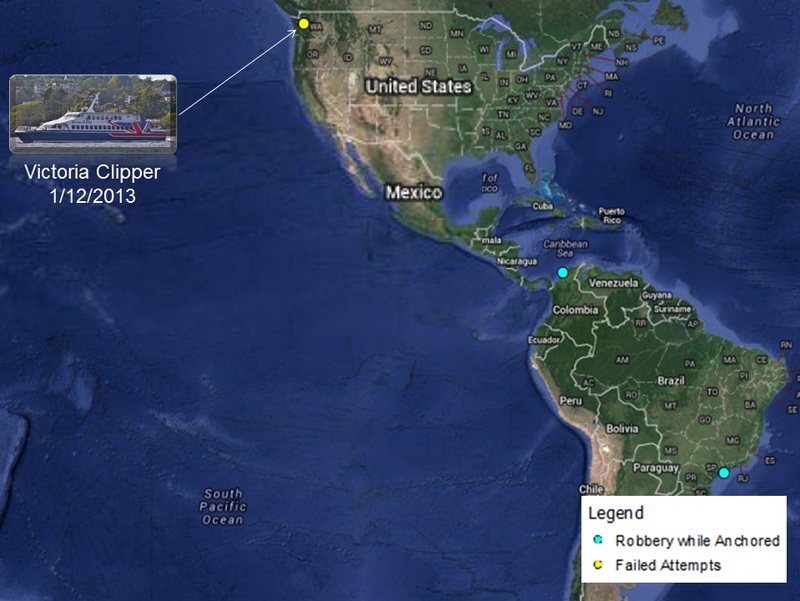 Three robbers boarded an anchored bulk carrier, broke into the forward store and stole ship property. They were spotted by OOW who raised the alarm resulting in the robbers escaping in their wooden boat. All crew safe. Date: 18-Dec-13. Time: 4:30. Vessel type: Supply ship. Flag: Singapore. GRT: 906. Position: 1° 15.30′ N – 104° 09.60′ E . Location: Southwest of Tanjung Ayam, Singapore. Area: Malacca Strait. While the supply vessel towing barge was underway, pirates boarded the barge, from a wooden craft which was alongside the barge. The pirates left the barge at or about 0535hrs after taking some ropes. Date: 18-Dec-13. Time: 5:05. Vessel type: Bulk carrier. Flag: Panama. GRT: 22863. Position: 12° 05.90′ N – 45° 24.39′ E. Location: Gulf of Aden, Yemen. Area: East Africa. While transiting the IRTC in westbound direction the bulk carrier spotted eight skiffs with three people in each heading towards the bulk carrier at very fast speed. Arms were sighted by the ship’s crew. The skiffs stopped at a distance of appr. 0.5nm. The onboard privately armed security personnel prepared for an armed response but suspicious craft did not further pursue the ship. Date: 18-Dec-13. Time: 20:45. Vessel type: Product tanker. Flag: Singapore. GRT: 14320. Position: 3° 47.50′ N – 98° 42.60′ E. Location: Belawan Port, Indonesia. Area: Malacca Strait. Pirates boarded a berthed tanker unnoticed. They broke into the ship’s forward stores and escaped with ship’s property. Date: 19-Dec-13. Time: 4:00. Vessel type: Chemical tanker. Flag: Viet Nam. GRT: 4159. Position: 1° 19.00′ N – 104° 16.00′ E. Location: Malaysia. Area: South China Sea. Alert crew on board an anchored chemical tanker noticed a speed boat approaching at high speed. Alarm sounded and ship search light directed towards the boat which had come alongside. Seeing alerted crew the speed boat moved away. Date: 19-Dec-13. Time: 5:00. Vessel type: Bulk carrier. Flag: Marshall Islands. GRT: 22432. Position: 32° 18.70′ N – 9° 14.90′ W . Location: Safi Port, Morocco. Area: North Atlantic Ocean. Two robbers attempted to board the berthed ship by climbing the stern mooring rope. Alert duty crew noticed the robbers and informed the OOW who raised the alarm and crew mustered. Upon seeing the crew alertness, the robbers jumped into the water and escaped in a small craft. Date: 19-Dec-13. Time: 8:30. Vessel type: Chemical tanker. Flag: Marshall Islands. GRT: 27357. Position: 3° 54.80′ N – 98° 47.90′ E. Location: 9nm off Belawan Port, Indonesia. Area: Malacca Strait. Robbers boarded an anchored chemical tanker unnoticed. They broke into the ship’s forward stores and escaped with ship’s property. Date: 20-Dec-13. Time: 23:20. Vessel type: Chemical tanker. Flag: Turkey. GRT: 1803. Position: 3° 54.00′ N – 98° 47.00′ E. Location: Around 7.0nm NNE of Belawan Port, Indonesia. Area: South China Sea. Robbers boarded an anchored tanker unnoticed. Broke into the forecastle store. Date: 22-Dec-13. Time: 2:06. Vessel type: Containership. Flag: Chile. GRT: 16986. Position: 24° 07.00′ S – 46° 19.00′ W . Location: Santos Anchorage Area No. 4, Brazil. Area: South America. During safety rounds, OOW on board an anchored container vessel noticed three armed robbers opening some containers and immediately informed the bridge. The robbers spotted the crew and held him hostage. The alarm was raised, the robbers released the crew and escaped in a small fast boat with some cargo stolen from the containers. All crew mustered and the Harbour Master was informed. Date: 28-Dec-13. Time: 1:02. Vessel type: Oil Tanker. Flag: Marshall Islands. GRT: 41526. Position: 10° 18.00′ N – 75° 32.00′ W . Location: Momanal Anchorage, Colombia. Area: South America. Robbers boarded an anchored tanker via the hawse pipe, stole ship properties and escaped without being noticed by the deck patrol. Date: 31-Dec-13. Time: 0:55. Vessel type: General cargo ship. Flag: Netherlands. GRT: 5925. Position: 4° 53.00′ N – 1° 41.00′ W. Location: Takoradi roads, Ghana. Area: West Africa. Three robbers boarded an anchored general cargo vessel. When spotted by the security watch on deck, the robbers immediately escaped. « Is MLC Having Any Effect?